The RhinoFit yoga studio software provides the operational tools to help run your business efficiently. Easily process one time or recurring payments with credit card or ACH. Accept payments in person or on your website to maximize sales. 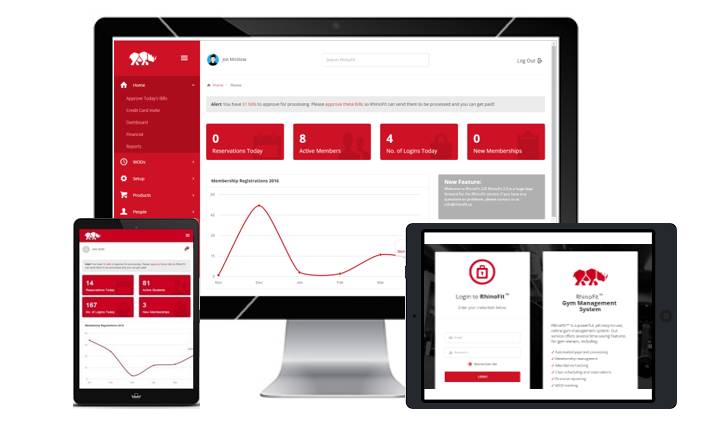 Set up and embed your calendar on your website so that your members can schedule classes and individual sessions online or via the RhinoFit app. Build a custom product store integrated on your website, track your inventory, and sell your products online with our product management tools. Create email campaigns and run special promotions for your dojo to send to your potentials prospects or current gym members. Protect your business with our customizable e-sign waivers. Create waivers and other health forms & capture your member’s signature with a simple mouse grab or finger touch.